A business entity’s need for a Basic Business License depends on the jurisdiction in which it is operating, as well as the type of activity it will be conducting. A handful of states currently have a business license requirement in place. 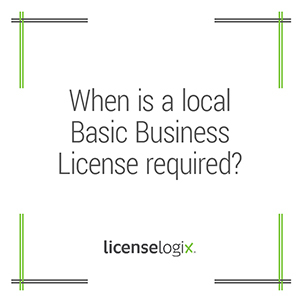 However, basic business licenses are most often issued at the local level, both by counties and municipalities. Even after determining that a jurisdiction does issue a basic business license, any given business must then ascertain whether it must obtain that license. This determination is based on numerous factors that vary between states, counties, and municipalities. LicenseLogix will help your business determine the licenses that are needed and obtain all of the licenses and registrations required, minimizing time-consuming and costly delays. To get a free quote, please can fill in the form on the page bottom or give us a call at (800) 292-0909.